PITTSBURGH (AP) -On a night when superstars Sidney Crosby and Marian Hossa played together for the first time, a couple of fourth-line players grabbed the spotlight for the Pittsburgh Penguins. Jarkko Ruutu had a goal and two assists and Georges Laraque had a goal and an assist as the Penguins beat the New York Islanders 3-1 on Thursday in Crosby's first home game in more than two months. "Some nights, it's someone you don't expect," Ruutu said after posting his career high in points. "Tonight I was the guy. You play 400-some games, and get three points for the first time." Evgeni Malkin also scored his 45th goal of the season as the Penguins won their sixth consecutive home game and seventh of nine overall, extending their lead in the Atlantic Division to six points. "We know that to win in the playoffs everybody has to chip in," said Laraque, who has 1,028 career penalty minutes and only 148 points. "And tonight was our night." Josef Vasicek scored for the Islanders, who lost for the eighth time in 10 games. 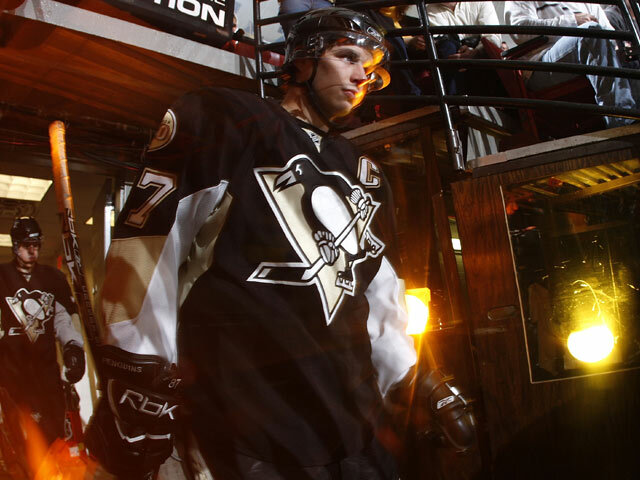 Crosby, who had missed the previous seven games and 28 of the past 31 with a high ankle sprain, didn't score. He took three shots. It was his first game overall since March 9. "(The ankle) feels a lot better," said Crosby, who played in three games earlier this month but then sat out when his ankle was subsequently sore. "My timing's still not there, but as far as the ankle goes it feels OK.
"(The ankle) won't be an issue." As expected, the reigning NHL scoring champion skated on a line with Hossa and Pascal Dupuis - two players who weren't on the team when Crosby was injured Jan. 18 against Tampa Bay. Hossa and Dupuis were acquired from Atlanta shortly before the trade deadline last month for three players and a first-round draft pick. Hossa missed six of his first seven games with Pittsburgh due to a knee injury. 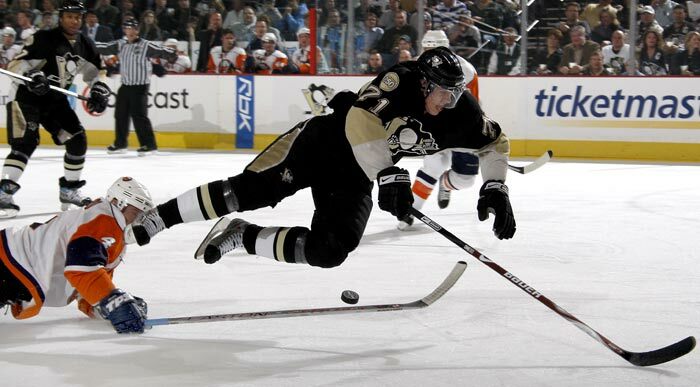 This was the first game Hossa and Crosby both played for the Penguins. "We killed a lot of penalties and things tonight, so it was hard to get into a rhythm while we were out there," Crosby said. "But we created some chances." 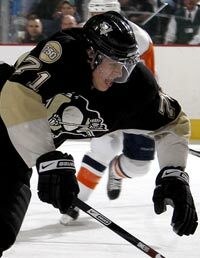 Malkin scored the first goal 6:53 in when his wrist shot through traffic from the right faceoff circle went through the legs of Islanders goalie Wade Dubielewicz. The Islanders tied it 10 minutes later when Vasicek finished a 3-on-3 break by flipping a shot that found its way underneath Penguins goalie Marc-Andre Fleury's arm and into the net for his 15th of the season. "I thought the effort was there," Islanders coach Ted Nolan said. "They get a guy like Crosby back and Hossa comes back... They're a pretty explosive team. "I thought we did real well." Fleury has won his past six starts, allowing only seven goals in that span. Ruutu's goal came while short-handed with 4:38 to play in the second when a pass by New York's Richard Park was never corralled by Miroslav Satan and Ruutu collected it at his own blue line, skated down the left side, went around the net and banked the puck into the net between Dubielewicz's legs on the wraparound for his sixth of the season. Ruutu scored for the third consecutive home game and fourth time in six games overall. His career-high three points gave him six in his past six games. Moments after the Penguins' high-profile power play failed to score for the fifth time in the game, Laraque and Ruutu combined to give Pittsburgh insurance with 13:20 to play. Known more for his fighting then scoring, Laraque scored for only the fourth time this season and first time since Jan. 8 off a pass from Ruutu. Hossa left the game with 16:23 to play after he was clipped during a blind mid-ice collision with the Islanders' Sean Bergenheim. Hossa, who previously had left the game briefly during the second after a hit on his knee, was on the ice for a few minutes. He did not return. The team classified it as an upper-body injury and said he was day to day, further jeopardizing the pairing of former 100-point scorers Hossa and Crosby. "What are you going to do?" Penguins coach Michel Therrien said. "Eventually they will play together. It was a good combination for the amount of time they played together. They will be fine. I'm not worried at all." Notes: Pittsburgh won the season series 5-3. ... Gonchar played in his 900th career game. ... Ruutu had only 10 points on the season before this recent hot stretch.